Welcome to the Cornwall Coastal Path as seen by Cornish light. The Coast of Cornwall, one of the most beautiful coastlines in England. From towering cliffs, windblown estuaries, superb surf beaches, fishing coves, harbours, to sheltered tree lined creeks, even an island topped by a castle. The Cornwall Coastal Path Coast Footpath makes so much of it accessible to the walker and hiker. 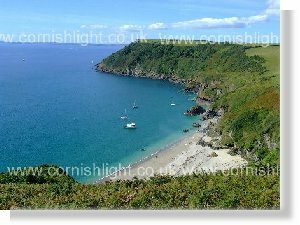 Though this is already a large section of the Cornwall by Cornishlight web site to complete it is a very long-term goal. We hope you like the pages we have live thus far. Thank you. 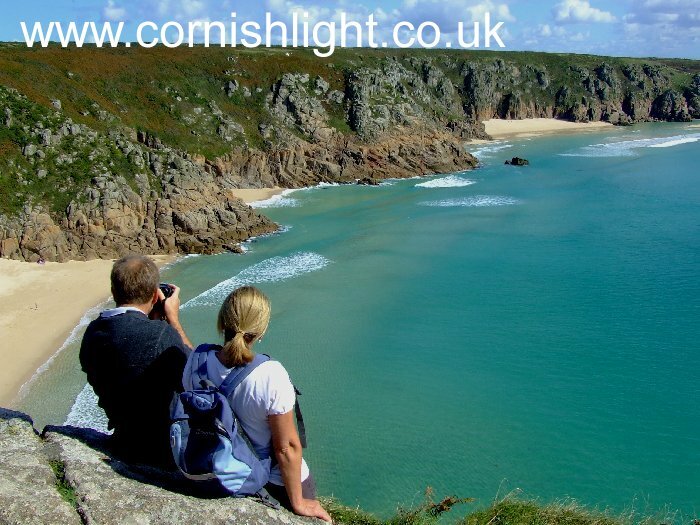 Explore the Cornwall Coast Path with us. Beginning on the Devon border and walking south towards Bude. Accommodation. Cornwall Holiday Brochures. Cornwall Beach Guide. No guide to the Cornish Coast is complete without mention of some of the county's many beaches. From Hartland Point across the Devon Border to Bude. The coast north of Bude to Northcott Mouth and Sandymouth and towards Morwenstow provides dramatic views no more so than Duckpool. Bude to Boscastle. The only natural harbour for 20 miles along the North Cornwall Coast. Walk south along the Coast across Willapark, often wave lashed Long and Short Islands in the distance. Tintagel to Port Isaac. Still a working fishing village. White washed cottages, narrow streets (opes) leading down to an ancient sheltered harbour. Port Isaac to the surf beach at Polzeath. Around the corner Rock -in season alive with the sound of stays and sails flapping in the sea breeze. Catch the foot ferry to Padstow. Backed by Trevose Head. Beyond that lovely beaches such as the sheltered Harlyn Bay and further west towards Newquay Constantine Bay, with the Atlantic Ocean breakers rolling in. Across the River Gannel from the town of Newquay superb coastal walks are to be had, from Crantock or by driving further afield. Such as Carnewas NT 5 miles west, great pinnacles of wave lashed rock, beneath massive cliffs. St Ives to Lands End. Rugged granite cliffs, and headlands, a hinterland dotted with prehistoric remains, small fields- a unique and precious landscape. Sennen Cove | Cape Cornwall | Lands End. Porthcurno to Mousehole. In nearby Penberth Cove flowers were once grown in the small fields clinging the valley sides. Today of the fields are overgrown. Mousehole with its coastal cottages over looking the harbour. From Mousehole walk east to bustling Newlyn, the largest fishing port in the South West, hence to Penzance with fine views across the Bay to St Michael's Mount . St Michaels Mount to The Lizard All along the western side of the Lizard Peninsula the Cornwall Coast Path offers wonderful views over to Porthleven. From St Mawes, around St Anthony Head, along the South Coast of the Roseland Peninsula. Portscatho and so picturesque Portloe both with their sheltered harbours. Explore the off the beaten track Cornish Coast. Hence to Carrick Roads and Falmouth. 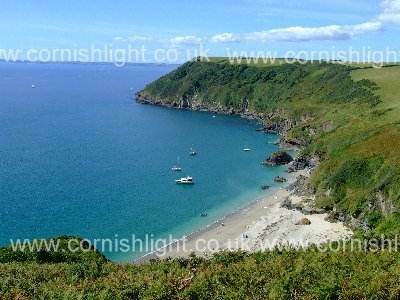 Continue along the coastal footpath around St Austell Bay past Gribben Head marking the eastern limit of the bay and the entrance to the Fowey Estuary. Fowey to Polperro to Looe. The National Trust in one of their Coast of Cornwall leaflets, rightly describe this particular stretch as "this wonderful coast". Fowey. Chocolate box Polperro. Looe still a working fishing harbour. Looe to Rame Head. Beaches such as Seaton and Millendreath- with the right wave conditions Whitsand Bay popular with surfers. Around the headland villages such as Kingsand and Cawsand a delight to explore. Hence to the River Tamar. World Heritage Status awarded in 2006 by Unesco. Explore the region's tin mining heritage, from the stark beauty of the remains of engines houses, ports and mineral foundries to the often brutal and shortened lives of the hard working miner. Cornishlight on YouTube A new section begun in 2009 featuring short videos of Cornwall and Devon, including several of the Cornish Coast..
Cornwall's most precious asset is its spectacular coast line, with all its contrasting landscapes from the lonely, towering cliffs of the North Coast to the gentle inlets of the Fowey and Fal estuaries. Please read our disclaimer. Warning. Any activity has inherent risks particularly in the wrong conditions or with inadequate preparations or inadequate equipment. The information in this website is provided solely for your educational use, and SHOULD NOT be used as a substitute for actual training from qualified experts or experience or formal advice and guidance. 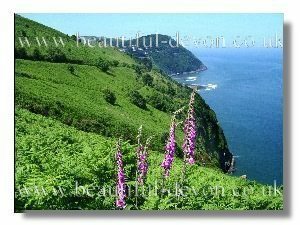 Climbing, hill or Cornwall coast walking, and other such activities can be extremely dangerous and can result in injury or permanent disability or even loss of life. Participants and spectators in any activities are presumed to be aware of and accept the inherent risks which include but are not limited to those mentioned here and be responsible for their own involvement. Cornishlight and its contributors can not be responsible for the consequences of your participation, or the participation of those in your care,in such activities. Wear suitable clothing and footwear. Some sections are steep, and conditions underfoot may be loose. Though the route is generally well marked, have a decent map to hand. Take a mobile phone, but expect to have 'no signal' in places. Take account of weather conditions, note the forecast. Take account of the likelihood of encounters with water, such as river, stream, lake, canal, estuary, ocean or sea. Take account of the state of the tide. Don't find yourself cut off by an incoming tide. There is no such thing as a freak wave. You MUST expect very very large waves at any time. If walking alone tell someone you can trust your route and when you intend to arrive at your destination for that day. Even at the height of summer you may well be fortunate to have a particular stretch all to yourself, with only the nature and wildlife for company. Though Local Authorities, landowners including the National Trust, make sterling efforts to maintain public rights of way stretches may become overgrown particularly in late spring. Beware paths, at any time of year, may be loose, muddy or slippery, contain trip hazards, br blocked, obscured by overhanging branches or undergrowth, or even disappeared altogether due to erosion. Stiles, steps and barbed wire fences. Cracks may have opened up, overhangs formed particularly along the cliff edge. Any walk may involve encounters with traffic, and unpredictable livestock. In mining areas take particular care. Though the now ruined engine houses and spoil heaps of old mine workings are so picturesque they often hide a maze of tunnels and adits, any of which may have opened up due to subsidence. It is not a matter of mere chance that so much remains wild and unspoilt. For more than 100 years the National Trust has gradually been protecting more and more of the Cornish coast, standing as a bulwark against the pressures of development for short-term gain. Today more than 40% of the county's coastline is protected by the Trust. . It would be easy to take this for granted, but it has only been achieved thanks to the endeavours and financial support of many people over the years who have cared. Nearly 40 years ago the Trust's national appeal to protect the coast was launched, and it has since raised enough to buy more than 400 miles. . The Trust has begun this new millennium by re-launching the Neptune Coastline Campaign with the aim of raising enough money to secure the 100 miles of highest quality coastline in England, Wales and Northern Ireland which remain at risk. Nowhere can the work of the Neptune Coastline Campaign be better appreciated than here in Cornwall. Just £40 buys one foot of coastline and protects it forever. Will you help us? Please contact: The National Trust, Cornwall Regional Office, Lanhydrock, Bodmin, Cornwall PL30 4DE; tel: (01208) 74281. Much has been done, but there still much to do.